Maxi Tyrosine Plus™ is our unique combination of tyrosine and phenylalanine. It gives nutritional support to the thyroid, adrenals and pituitary glands. It supports memory hunger pang management. Tyrosine functions as the building block for protein and supports alertness and mood. Phenylalanine is an essential amino acid that accumulates in the body to produce neurotransmitters, the chemicals that relay messages through the nerves to the muscles and brain. 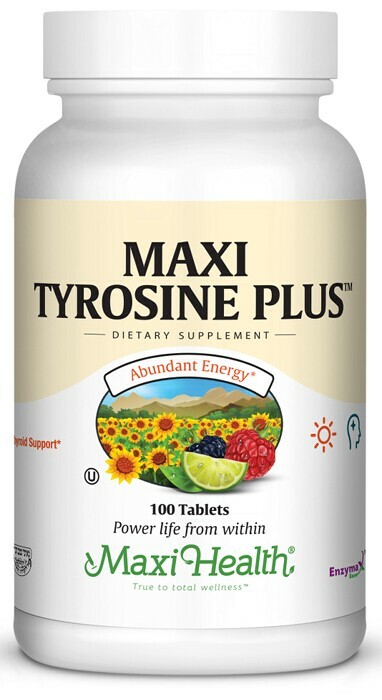 For your optimal performance, try Maxi Tyrosine Plus™ from Maxi-Health Research! Dicalcium phosphate, microcrystalline cellulose, vegetable stearine, Enzymax® (calcium carbonate, bromelain, papain, lipase, amylase, protease, silica), modified cellulose gum, silicon dioxide, and aqueous film coating (purified water, hydroxypropyl methylcellulose, vegetable glycerin).